Taking a turn away from the characterization article links today to give something else. It's the end of the year and it's party season, so that for us women equals... High heels! Thought you'd want to read these tips about how to walk in heels. They're really good! The article is from MSN Lifestyle and can be found online here. Never wobble again! How to look and feel fabulous in your spikes. THE BODY: If a stiff shoe causes blisters, spritz this area with water and use your fingers to mold the softened leather to the shape of your foot or try special inserts to reduce friction. THE BREAST: The inner arch of the heel, which affects stability. The farther forward the arch, the less you will feel off-balance. THE SOLE: Slipping on slick floors? Pick up a pair of sole protectors or score the soles of your heels with a key to create extra traction. THE TOE BOX: If your toes feel pinched, have this area stretched out at your local shoe repair shop. THE INTERIOR: If you suffer from low arches, slip in supports to relieve pressure on the balls of your feet. 1. POSTURE: Heels pitch weight forward, so for balance, keep your head up and shoulders back. Tightening your core will offset some of the pressure on your feet. 2. 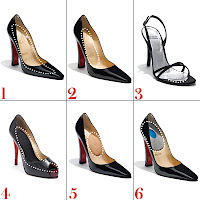 STEPS: Striding in a normal heel-to-toe motion can snap a stiletto or twist an ankle. Instead take short steps, going down evenly on the ball of the foot and heel. 3. WEIGHT: As your weight shifts fully onto a foot, spread your toes in the shoe slightly; this will help to distribute the weight onto the ball of the foot. 4. HIPS: When you're feeling off-balance, you tend to stiffen up. For an easy, attractive momentum, let your hips swing in small, sideways, figure-eight motions. 1. WHOLE-SOLE CUSHIONS: A comfort insole that's tapered at the front so your toes won't feel crowded. 2. WEIGHT SHIFTERS: This sized insert sits in the breast of the shoe, shifting weight off the ball of the foot and back onto the heel. 3. TOE GELS: Provides cushioning under the ball of the foot to protect the area where most of your weight is centered. 4. OPEN-TOE STOPPERS: A shorter insole that provides the same shock absorption without being seen through your peep-toes. 5. ARCH SUPPORTS: If your arches are low or need a boost, these supports will help relieve pressure on the balls of your feet. 6. HEEL PADS: Liners that help keep feet from slipping around inside shoes. Foot experts warn that the unnatural slope of stilettos puts unnecessary strain on feet and lower leg muscles. Footwear brands like Fit Flop, Reebok and Skechers claim that the specialized midsoles in their toning shoes strengthen leg muscles and improve posture, which could help prevent heel-related injuries. 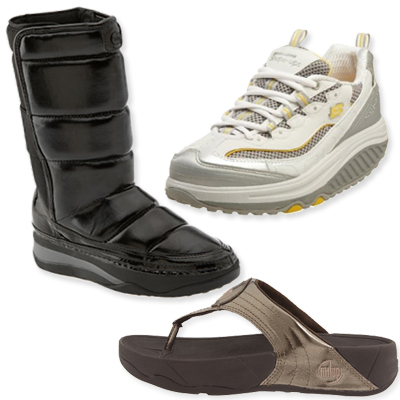 Women's Snugger boot, Fit Flop, $124.95; at Amazon.com. Jump Start walking shoe, Skechers, $104.95; at Amazon.com. Walkstar III, Fit Flop, $59.90; at Zappos.com. Refresh tired feet with a tingly foot treatment. Peppermint purifying foot mask, The Body Shop, $17; at thebodyshop-usa.com. Zee, I'm with J Hali! If I have to think about that much stuff, I'd rather be unfashionable and wear my flats. It has to be a very special occasion for me to put on heels these days. LOL! Lol ladies! I still wear those occasionally. Nothing quite beats the thrill of getting into a slinky pair of sandals with towering heels. But then too, I'm so small I welcome any additional height I can manage, lol.